The Ballina Migrant Health Forum (BMHF) was launched at a the seminar Participating in Your Health Service held last Tuesday 11th May in the Ballina Family Resource Centre. 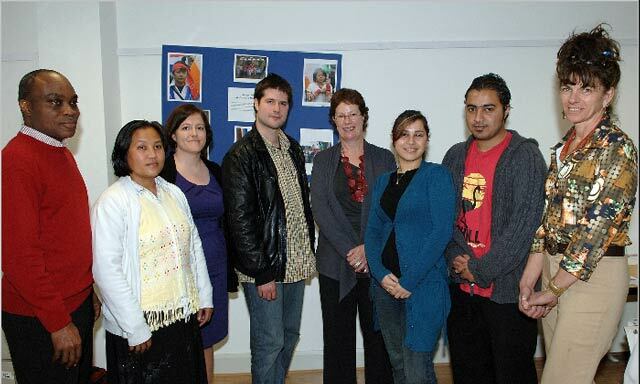 The Ballina Migrant Health Forum (BMHF) was formed in 2009 as part of a unique Community Participation in Primary Care Project in Ballina which was delivered by Mayo Intercultural Action in partnership with the Health Service Executive. The Ballina Migrant Health Forum (BMHF) is working to improve the health and well-being of migrants in Ballina and to promote migrants' participation in primary health care structures. l-r: Augustine DesMennu (BMHF), Thaw Thaw Soe (BMHF), Michelle Rooney (MIA), Pawel Bednarczyk (BMHF), Dr. Jane Pillinger (Project Evaluator), Rebeka Soares (BMHF), Aminullah Jan Wazri (BMHF) and Suzette Ruane (BMHF). Speakers at the event included members of the BMHF, Laurence Gaughan, HSE Primary Care Development Officer, Michelle Rooney from Mayo Intercultural Action. The keynote speaker was Dr. Jane Pillinger, Independent Researcher and Policy Advisor, and the Project Evaluator for the national Joint Community Participation in Primary Care Initiative provided the seminar with a national perspective on the development of community participation in primary care, and a breakdown of the recommendations for the development of effective community participation. Community participation in primary care is a process to enable people to have a say in how health services are delivered. Michelle Rooney of Mayo Intercultural Action said "the seminar was an excellent way to present the great commitment and achievement of the volunteers who are part of the Ballina Migrant Health Forum. The speakers provided an excellent introduction to the concept of community participation in primary care, and how to progress this process in Co. Mayo. The process of community participation is relevant to all members of our community and aims to improve the effectiveness of health services and reduce health inequalities." Suzette Ruane of the BMHF said "the Ballina Migrant Health Forum gives a voice to migrants and a place to raise concerns and worries. The empowerment of migrant communities on such a vital issue as health is of huge benefit." The BMHF has members who are Brazilian, Polish, Nigerian, New Zealander, Kenyan, Afghan and Karen from Burma. These individuals are amongst the 8% non-Irish population in Ballina area. The formation of the BMHF is part of a process to develop a wider community health forum to benefit all members of the community. A community health forum gives an opportunity for various elements of society in Ballina to work together on wide ranging issues that affect the well-being of members of the community. The Joint Community Participation in Primary Care Initiative was initiated in 2008 by the former Combat Poverty Agency (now the Social Inclusion Division of the Department of Social and Family Affairs) and the Consumer Affairs Department of the HSE. The purpose of the initiative was to support and enable disadvantaged communities and groups to participate in local primary care teams and networks that are being developed in the context of the primary health care strategy, Primary Care: A New Direction, to support and test methods of community participation in primary care and to promote a partnership approach between community organisations and HSE. Community Participation is a process that enables people to become involved in decision making on how services that affect their lives are delivered. Community participation in primary care aims to encourage and support people to work in partnership with their local Primary Care Team in the planning and delivery of primary health care services in their community. The Primary Care Team is the first point of contact with the health services. It is made up of several frontline disciplines including GPs, Public Health Nurses, Practice Nurses, Home Helps, Physiotherapists, Occupational Therapists, Social Workers and Admin support. There will be 14 Primary Care Teams developed in Co. Mayo.